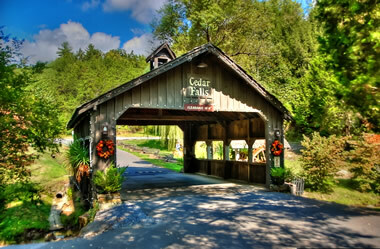 Cedar Falls Resort is a luxury cabin development located off Waldens Creek Road in the Pigeon Forge/Bluff Mountain area. 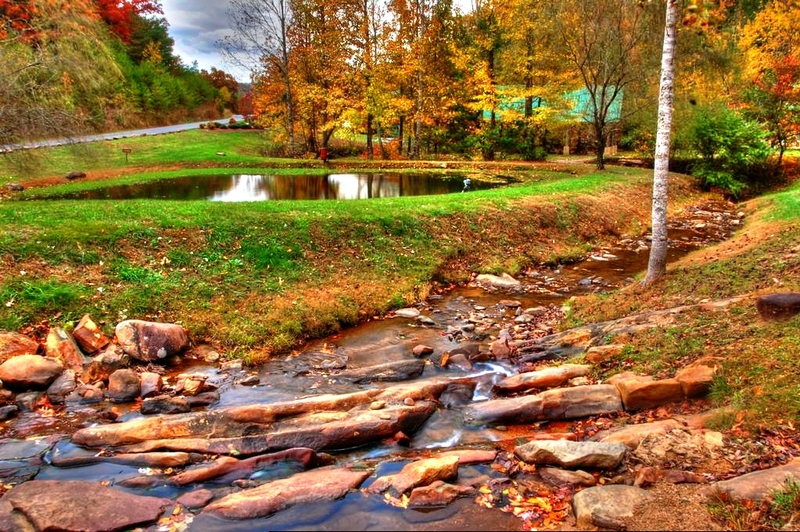 The subdivision is approximately 10 minutes from light #3 in Pigeon Forge (Wears Valley Road). The location is ideal with the country and mountainous feel, yet only 10 minutes from the main Parkway and attractions such as The Island. It is approximately 5 to 7 minutes from other attractions such as Waldens Creek Stables and the Smoky Mountain Alpine Coaster. Many restaurants and plenty of shopping are within 10 minutes of Cedar Falls. There are two grocery stores, Kroger and Publix, that are accessible without having to get on the Parkway in Pigeon Forge. This makes it much easier to deal with traffic during heavy tourist days. The development is fairly unique for the Sevier County area in that it has a fairly even mix of luxury overnight rental cabins, permanent residences, and second/vacation cabins located within the subdivision (see map below for details). This diversity helps establish Cedar Falls as one of the premier cabin resorts in the area for both residences, vacation cabins, and overnight rental cabins. The development was started around 2003 and has seen quite a few luxury cabins built since then. Cedar Falls was developed by Gary Fields, who also developed The Summit on Bluff Mountain. Cedar Falls’ amenities are second to none in the area, yet still have a relatively low HOA fee at $800 per year. The land varies quite a bit within the development. Some lots and homes offer a creekfront setting on Sandsuck Branch (which ranges from roughly 5′ to 20+ feet wide). Others, especially those in Phase IV, offer outstanding mountain views. Many other lots offer private settings or fairly flat land ideal for a permanent residence. Prices within the development vary tremendously depending on the size and amenities within the cabin. Cabins within the development are typically priced between $300,000 to $600,000 with a few properties valued considerably higher. The size of the cabins range from one bedroom honeymoon cabins to luxury 6 bedroom cabins including one with its own outdoor pool, private putting green, and incredible mountain view. There are still several vacant lots where cabins can be built. Most lots range from approximately one half acre to a little over an acre. There are some larger lots in the range of 2 to 8 acres, but they aren’t as common. Lot prices have varied from as low as $20,000 to above $150,000. Real estate in Cedar Falls is among the most desirable in the Pigeon Forge area of Sevier County. Some lots are steep, but the majority are gradually sloping, rolling, or level ridge-tops. Other neighborhoods have higher percentage of lots having mountain views.